THE QWIKCHUTE WAS DESIGNED AND BUILT TO ACHIEVE THESE GOALS. IT IS CONSTRUCTED OF HEAVY GAUGE STEEL WITH A DURABLE POWDER COAT PAINT FINISH AND A REPLACEABLE HIGH IMPACT PLASTIC DOOR PLATE. 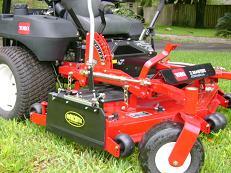 THIS DESIGN INSURES THAT THE QWIKCHUTE WILL LAST MANY MOWING SEASONS. 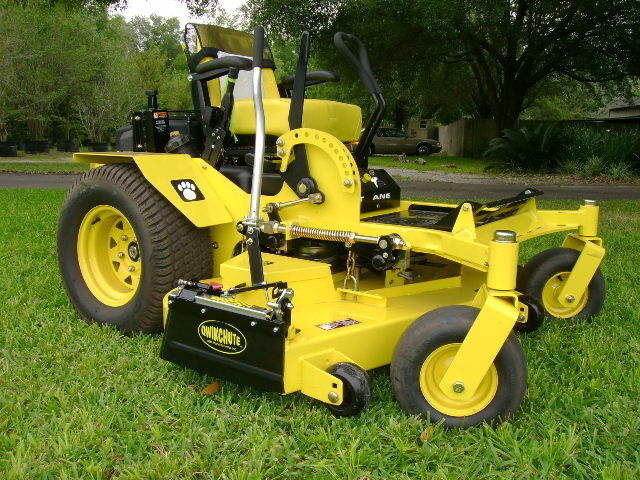 With only minimal effort and a few seconds the mower operator can choose how to direct the grass clippings to Mulch, Full Discharge or 1 Partial Discharge position. The Qwikchute installs in 30 minutes. Simple Mechanical Operation ensures years of Trouble Free Service. With the time savings and versatility, the Qwikchute returns its cost many times over. 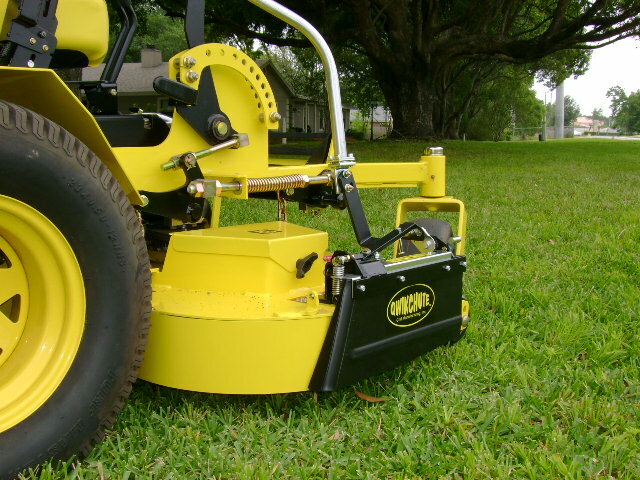 A completely open Qwikchute allows maximum clipping dispersion thus increasing mowing speeds and decreasing time spent raking or re-mowing to chop in clippings. 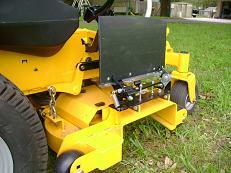 The Qwikchute offers the option of 1 partially open position when full discharge or mulching is not the best choice. With the ability to quickly close the discharge chute, the operator can protect passing motorists, pedestrians and other landscape workers. 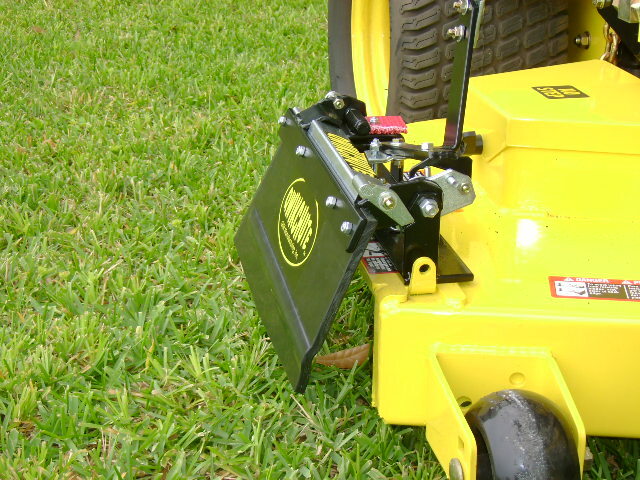 With a push of the wrist, the Qwikchute door closes and creates a mulching machine for the areas in which clipping creates a problem such as flower beds, road ways, side walks, pools, and other small areas. Leaf and shrub trimmings are quickly turned into fine mulch and disappear into turf and enrich the soil as compost. The Qwikchute saves time and effort by greatly reducing clean-up costs.. 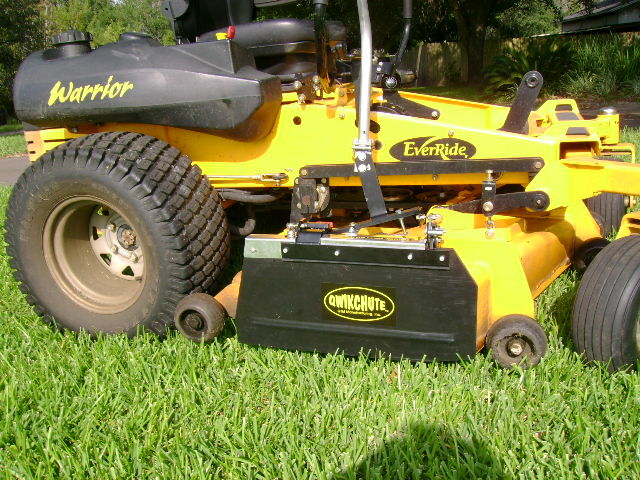 The Qwikchute offers the choice of 1 partially open position, when open discharge or mulching is not the answer.